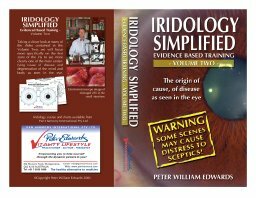 Peter Edwards is without doubt, the most competent Iridologist I know of anywhere in the world. He has been able to successfully blend ‘the science’ with ‘the art’. FOUR DVD’s purposely designed, recorded and taught by a genuine MASTER IRIDOLOGIST make it possible to study this high quality course successfully at home. I believe in home study! As I relate to my students, I fell asleep many nights while looking at my mentor’s Iridology videos. This is how I learnt to read the eyes. One day, as I was looking in someone’s eyes, it was as if my mentor was speaking through me. I surprised and impressed myself! I have asked if my course is the same or offers more than other courses available. I must state clearly that the course I offer is unlike any Iridology course anywhere in the world! I have practiced Iridology since 1984 and have taught this subject at Government approved teaching institutions since 1989. In the Nineties I became a ‘MASTER IRIDOLOGIST’ and was requested by the Head of Academic Faculties to take charge on Iridology Studies and Naturopathic Prescribing and present extra classes for the entire college (years 1 to 4) to enjoy and benefit from the experience of my presentations. I have been flown nationally and internationally, presenting to literally thousands of medical and non-medical practitioners. My reputation has generated more invitations to speak as a VIP speaker internationally (including an invitation from the American Presidential Physician and Dean of Traditional Medicines University of Peking) than I have been able to keep up with! 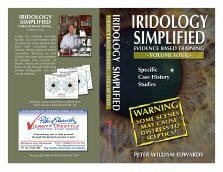 Over the 20 years of practice and experience, after studying both the Jensen and Angerer system of iridology, I have gradually developed (without realising it over this time), a style of Iridology that is to my mind, much simpler and importantly, much more efficient than what is available elsewhere, hence the name, ‘IRIDOLOGY SIMPLIFIED – EVIDENCED BASED TRAINING’. I must also add, the course of instruction I offer is much more than just teaching how to practice Iridology successfully. Reading the eye is just one part of a complete integrated system and method of clinical practice that has proven to be highly successful. I can assure you, knowing how to read the eyes is of little use if you do not know how to specifically and successfully communicate, educate and treat the patient! Yet this is a weakness of most courses of this day. A lot of technical know how with little practical application in a ‘real life’ situation. You must know how to tie it all together! Throughout all my seminars whether they are on Iridology, nutrition, exercise, personal training, rejuvenation or whatever, most subjects and concepts covered usually come up and are discussed because of the simple fact that it is all related! This style of teaching is unique to my courses as I teach a method of ‘biological lifestyle therapies’ that connects both practitioner and patient to the very powers of nature and creation themselves. 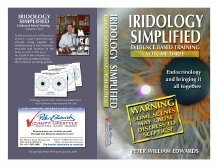 It is a ‘no-padding’ or time wasting, ‘Fast-track’ Evidence Based Training course for all who are serious about understanding the science and practice of Iridology. A serious course for serious students! Attendance at live training seminars is the most effective way to learn professional iridology skills however; the FOUR recordings contain all essential information from the seminars. I have developed sufficient visuals (DVD’s) to enable the entire course to be done externally without having to attend a seminar if it is not possible for you to attend. However, if you are to ‘lead your field’, the seminars are ‘a must’! 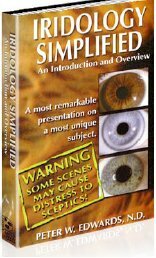 As the title suggests, this is an ‘Introduction and Overview’ of the Science andPractice of Iridology. It has been one of the main catalysts of new patients booking in to have a consultation with me. I am very proud to share that this one visual recording has introduces the concept of ‘IRIDOLOGY’ to this country. Here we will go into more detail of the slides in Volume 1. We will specifically study the first zone of the iris revealing ‘The origin of cause’ – of disease as seen in the eye’. We will study ‘Specific Case Histories’ and generally fine-tune skills and our ability to understand and apply what we see in the eyes to the patient’s condition. The origin of cause, of disease as seen in the eye. Even now, this subject still thrills me as I have seen the power of correctly understanding the chemistry, structure and function of the body on a cellular level – as seen in the eye. We will study zone two, specifically the hormone secreting glands of the body ‘Endocrinology’. This is afascinating look at the chemistry of the body and how it affects the structure and function (including neurological) of the entire body. From here we will look at zones three and four and tie it all together. When I learned to understand how to view the hormone secreting glands of the body through the eye, it revolutionized my clinical practice. This information ties in the other lessons to make a practical tool for recommending dietary, attitude and lifestyle changes where necessary. Five specialised Learning CHARTS are included in your course. These have been specifically designedto enhance your learning and ability ‘skill’ to successfully utilize this unique method of health analysis. You can even use on to analyse your own eyes! Learn from literally ‘hundreds’ of the finest quality iris images available anywhere in the world. Along with the irises, importantly, detailed ‘Case studies’ to bring the eyes alive! Every eye tells a story that can assist you greatly in correctly identifying and then importantly removing the cause of health conditions. 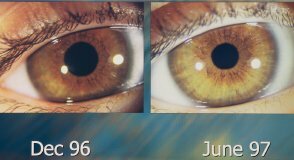 Even before and after photos of the same eye. Who says the eyes don’t change? The examination for this course is a research project and will be carried out during the time of this study course. After successful completion of the above course, an accolade will be awarded. This course will show you how to practice iridology effectively and successfully. For those who want to get serious about Iridology, I recommend you purchase an Iris microscope. I am a supplier of the finest equipment on the market. I will show you how to use an Iris microscope, take great iris photos and generally gain the skills necessary to practice this art skillfully. This is serious Iridology training for a Successful practitioner! Learn from some one who really knows this subject. After giving Pauline my thoughts on her eyes, showing her, her iris, and explaining the fermentation of lactose/sugar, how it creates the acid then how the body stores water to dilute it etc., she was over the moon about it all. Even though she has been on a pretty good diet from when she met Ken……. she had been to two other iridologists and they both said, “Good, just keep on going the way you are” She was delighted that someone had finally given her some answers she was looking for, and that now it makes sense. Thank you, Peter, that you not only know what you are talking about but you actually have a desire to share it with other people who in return get much satisfaction from helping ‘other’ people. After hearing what she said, I feel you have taught us well with the whole picture complete, which brings me to the question, ‘How many iridologists are out there telling people they are doing well, and sending they away still poisoning their bodies?’ I’ve said it before, I feel so privileged to have studied with YOU! !